PHILADELPHIA, PA--(Marketwired - Oct 29, 2014) - Robeks, a premium fresh juice and smoothie franchise with more than 200 locations open or in development worldwide, has opened its first traditional store in Philadelphia. At 1035 Chestnut St., near the bustling Jefferson University Hospital district, the walk-in store is one of the first in the nation to feature Robeks' new Next Generation concept, an upscale revision of the interior and exterior of a typical Robeks store. The new store design -- at just less than 1,000 square feet -- is engineered to make Robeks more convenient and accessible to customers and more efficient and profitable for franchisees. 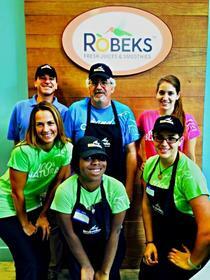 Kimberly and Matthew Berger, and their friend Michael Fornaro, are pioneering Robeks in the area. Kimberly serves as Regional Director for the region, providing support for franchise owners in Philadelphia and the five surrounding counties. The partners also introduced the brand's first-ever food truck to Philadelphia in July 2014. The roving truck, which can be found around the city at parks and events, also caters to private parties and sets up shop at businesses and festivals. It is a huge hit, and it serves as a traveling billboard for the Robeks name in the large metro area, which has more than 4 million residents and 39 million yearly visitors. "Greater Philadelphia is the perfect market for Robeks," Kimberly Berger said. "Our residents are active, they care about their health and they make a difference in their communities. They deserve -- and are beginning to demand -- healthy, delicious, and convenient alternatives to fast food. "We're thrilled with the response we're getting," Berger added. "We're attracting raving fans and potential business owners who want to own a business that's both profitable and healthy." Based in Los Angeles and founded in 1996, Robeks is known as a trailblazer in the smoothie and juice bar franchise industry. In the past year, the company has been dedicated to building its strength as a legacy brand -- a best-in-class fresh juices and smoothies franchise that leapfrogs over the competition. To learn more, including the Robeks startup costs and financial performance, visit www.robeksfranchise.com. Kimberly and Matthew Berger have partnered with long-time friend Michael Fornaro to bring Robeks to Philadelphia’s more than 4 million residents and 39 million domestic visitors, many of whom come from East Coast markets already served by Robeks. Robeks fresh juice and smoothie franchise is a best-in-class brand. We offer the freshest, healthiest and tastiest smoothies and fresh-squeezed juices sold in a retail environment.